Make a lasting investment in the value of your home or business with our selection of advanced waterproof floors in Vaughn, ON. A pipe rupture can flood your basement and quickly ruin the flooring below. As you start the process of recovery, you need a flooring provider that offers a full line of products that are designed to endure heavy amounts of moisture. GTA Flooring Canada has the waterproof flooring you need to prepare your home for the next disaster. You deserve floors that provide you with the look you want, and the functionality you need. When you sit down with a design professional at our showroom, we ask you a series of questions that help us determine the right type of flooring for every room. 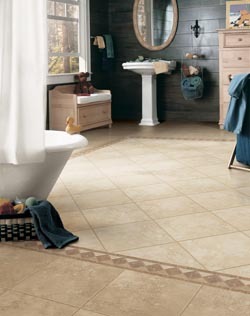 Our vinyl tile is a leading choice for those remodeling kitchens and bathrooms. When a client decides to replace the floors in a place like a basement or a laundry room, a waterproof product is always a smart choice. As your commercial organization recovers from a summer flood or a plumbing mishap, consider replacing the existing floors with a completely waterproof option. The added endurance and beauty give your location a look that customers will notice immediately. Start a conversation with our designers about flooring options from leading names like Downs H2O. Function and appeal are inseparable when it comes to our waterproof luxury vinyl planks. Rooms with higher levels of moisture may not be the best place to install natural hardwood floors. Luxury vinyl is designed to withstand the scratches and spills that come with having kids and pets, but extended periods of time underwater can take a toll. In the aftermath of a flood, your waterproof tiles and vinyl planks can be dried and reinstalled when the waters recede. Water-resistant vinyl flooring is backed by an installation warranty. We make it easy to find floors that match your needs with our 5-Star Selection System. Floors with water resistance are essential for families with young children and active pets. Spills are bound to happen at any time, so protect your floors with water-resistant carpet. Get the most from your flooring investment when you choose a group that offers water-resistant flooring installation. Each of our contractors has the experience needed to seal your floors the right way. When a flood rolls in, your waterproof tiles and planks can be recovered and reinstalled after your subfloor has been dried. Contact us today to redecorate your interior spaces with waterproof floors. We proudly serve customers in Vaughn, Mississauga, and Oakville, Ontario, and surrounding communities.